Ever since I started reading Jennifer 8. Lee’s Fortune Cookie Chronicles a few weeks ago, I’ve found myself wanting Chinese food everytime I pick up the book. To Jennifer’s credit, it’s no small feat to conjure up stirrings for eggrolls, bok choy and General Tso’s vegetarian unchicken during an 8 am subway ride! Jaden from Steamy Kitchen‘s tweet last week about her wonton recipe was just the thing I needed to satisfy those stirrings. You can find Jaden’s wonton recipe here. I followed her recipe almost to a tee except that I vegetarianized it and didn’t make the soup (although based on the wontons, I’m sure it’s yum). For our vegetarian wonton filling, I used half a head of red cabbage, finely shredded and diced along with 1 package of vegetarian teriyaki beef, pan fried then finely shredded and splashed on a bit of siracha hot sauce. I shredded and diced the cabbage by hand with a large knife, but in hindsight my food processor would have been quicker. Other vegetarian wonton fillings that would work deliciously: crumbled, pan fried tofu with scallions or other veggies * finely minced mushrooms with sweet corn * minced carrots, Napa cabbage and soy protein * the possibilities seem endless. Any other favorites you want to share? Leave them in the comments! 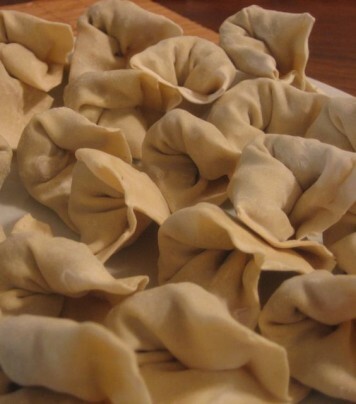 I picked up a few Wonton Tips that I learned along the way and plan to follow next time around. Check them out after the recipe and let me know if you have any other tips. Over time, we’ve made many different variations of Miso Soup using South River miso paste. So far we’ve tried the Three Year Barley Miso and the Chickpea Miso. Be careful when buying miso paste because many have dashi, a fish stock, in the paste. Check the label, but I believe most if not all of the South River pastes are dashi free and certified organic, which is one reason I like them. The other reason is because they have plenty of flavor without the meaty taste that some miso pastes have. The Chickpea Miso is particularly mild – it’s made with chickpea instead of soybeans and has a gentle, sweet taste. 1 bunch collard greens or kale, edges trimmed and cut into one inch ribbons – Time saver tip: when you buy greens, rinse, dry and store unused greens in a freezer bag lined with two paper towels. Store in your crisper or in the freezer. To save even more time, cut them before storing. If freezing, toss them straight from the freezer into the soup. They’ll cook in the broth. Also a great way to make sure greens don’t go unused. 1. In a large sauce pan, heat about one teaspoon of cooking oil (I use olive oil) on medium-high heat for about 2-3 minutes. Add onions and saute until translucent. 2. Add the greens and saute for 1-2 minutes until wilted. 3. Add about 4 cups water and bring to a boil. 4. Stir in two and a half tablespoons miso paste and chili garlic hot sauce. 5. Bring in to a boil. Add frozen wontons and reduce temperature to medium-low so you have a gentle boil. Boil for about 5 – 8 minutes. Be careful not boil too rapidly or your wonton may burst. You can also try Jaden’s no timing boil method described here – to adapt it for this recipe, just add 2 cups of water in step 3, the full amount of miso paste in step 4 and then 1 cup of room temperature water each time she refers to adding broth. 6. Taste the broth and adjust salt and miso paste as needed. Garnish with cilantro. There are a lot of different variations of veggies that go well with miso soup. We almost always include a base of onions and some variety of greens, but snow peas, carrots, button mushrooms and cubed, pan fried tofu are great additions as well. This is really a recipe where you can sub in leftover veggies from your fridge on cleaning day. Update: I forgot one of the most important details about the Miso Wonton Soup. 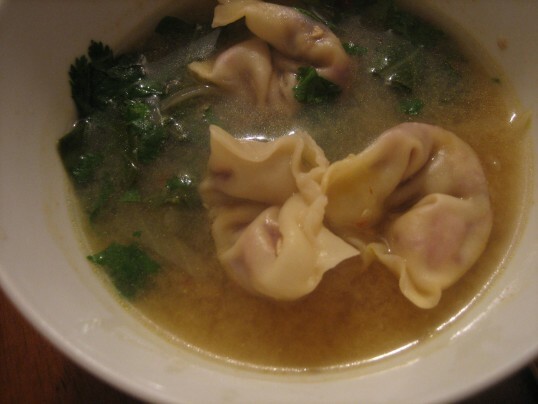 Wontons really make this soup special. There is something so delightful and pleasing to pop a whole miso soup infused wonton into your mouth. The broth soaks into the wonton filling and the juice just explodes in your mouth. Hopefully that makes sense. If not, try a mouthful of wonton and then get back to me. I tried a few methods for folding, and this is the one that worked best for me – I don’t know if it’s the “right” technique but it worked: Keep a bowl of lukewarm water or some lukewarm water mixed with a little cornstarch ready. Put about 1 teaspoon of filling in the center of the wrapper. Dab a little water along each edge of the wrapper. Fold over so you have a rectangle and firmly press all of the edges together using the tip of your thumb. Using your index finger, gently slide your finger over the filling from the center to the left edge then from the center to the right edge so that you spread the filling from the center to the outer edges. * Dab a little water along the far corners and the long side of the rectangle. Bring the two far corners together and press firmly. Place on a plate and repeat with the rest of the wrappers. *I didn’t pick up on this step of spreading the filling out until after I had folded many of the wontons. If you don’t spread the filling, you end up with air pockets in the wontons (which you can sort of see in the picture above). The pockets don’t detract from the taste, but it did seem to make it more likely that my delicate, precious wonton would burst when I boiled them. Wonton wrapping is tedious albeit rewarding! I recommend making this a two person job preferably over a glass of wine while comfortably seated. Nithya: Jaden, thanks! Not quite as cute and nurse cap shaped like yours, but very yummy. This looks amazing!!! Nicely done. Nith – I did something similar – my inspiration was your recipe and a dream that I had the night before! Bring one can of veg broth and one can of water to boil. Add soy sauce to taste, sliced green onions, dash of chinese mustard and maggie chili sauce to taste. Bring to boil and add pre-made pot stickers (wontons – veg, of course) AND kimchi! It’s delicious! A variation of your wonton soup!